Becca and I are super pleased to have editor and author C.S. Lakin of Live, Write, Thrive here today, because the stuff that comes out of her brain is just amazing. I’ve been lucky enough to read both her fiction and her writing craft books, and let me tell you, she knows her stuff! Susanne also helped us edit The Negative Trait Thesaurus, and we are forever grateful to her for her hard work! Today C.S. is going to help us hone in on the heart of our story through questions that ensure we’re staying on track and making the most of each scene, emotion and word. C. S. Lakin is a multipublished novelist and writing coach. She works full-time as a copyeditor and critiques about two hundred manuscripts a year. 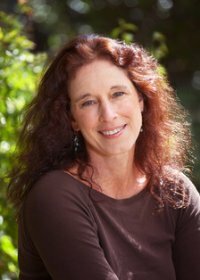 She teaches writing workshops and gives instruction on her award-winning blog Live Write Thrive. Her new book—Say What? 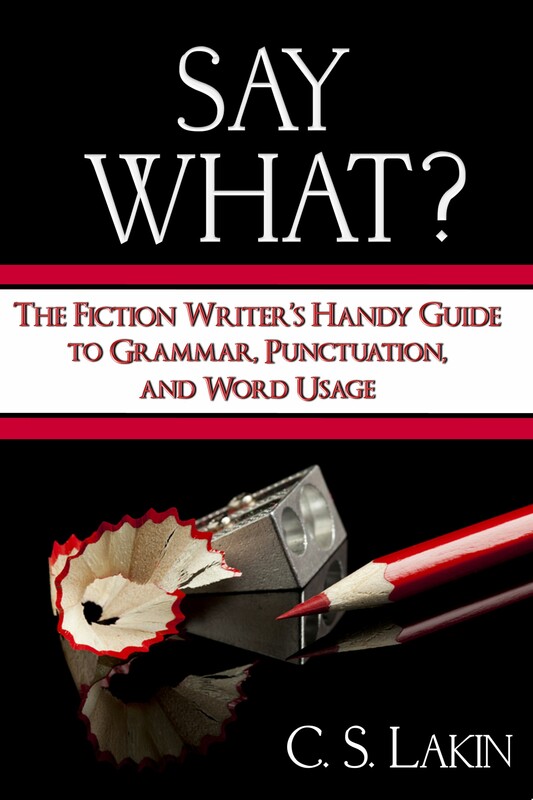 The Fiction Writer’s Handy Guide to Grammar, Punctuation, and Word Usage—is designed to help writers get a painless grasp on grammar. You can buy it in print here or as an ebook here. Connect with her on Twitter and Facebook. This entry was posted in Editing Tips, Guest Post, Revision and Editing, Uncategorized. Bookmark the permalink. This is great! I have several scenes in my maybe-novel that just lay there like a geriatric hound on a sticky summer’s afternoon. You establish the hierarchy: “First viscerally, then emotionally, physically, and finally intellectually”. Frankly this is the most helpful bit in this post for me, but I don’t understand the distinction you make between a visceral response and a physical one. Is it that the visceral response is reflexive and the physical response voluntary? Thank you for the thought-provoking, relevant post, C.S.! As an author in the final stages of my first romance novel, I can attest to the writing and editing process raising more questions along the way. I need to print this out and keep it by my computer! This is a great article. I clipped it to my Evernote files for future reference. Thank you . What a helpful article. I realized my ideas were vague, disorganized, and not always conscious to me the writer. Ooops! I now have a practical shopping list and in working my way through it, I find I have much more clarity about where I might be going, and what I need to address. This is a great post! I’m saving this and putting it in my permanent “writing help” file. Another question to ask is “why”? Particularly if you’re searching for a good, deep motivation. Thanks so much for this article, C.S.! I printed it out for easy reference later on. Great! Glad it helps. I often give hundreds of questions to writers when I critique their work. Questions hone in on the important motivation for characters. Thanks so much. This is helpful. My protagonist doesn’t know what he wants. He can’t explain his actions. He moves through life a newly single middle aged man learning by trial and error. He’s typical of many. The women he meets are the focus of a set of linked stories, each one moving him further down the road to wherever he’s going, each one of them being more likeable than he, each one teaching him something about himself, relationships and love, but the women never recur… this checklist is valuable though the answers may be a little different. Such a rich post. Thank you for this. It is full of good information. I will be posting the link on my blog soon. Great stuff! Thanks for sharing your thoughts! They really got the cogs spinning, and with each question I could visualize more and more of where my story is -what is going good based off that list, and what isn’t. If you had to pick one question to ask for the middle of the story, between the character’s re-commitment to her goal and the crisis, what would it be? Oh, and after reading Stacy’s question I am curious about one more thing. When incorporating back-story wounds to create a stronger present, do you have any thoughts on how the story’s flow is affected if the reader has a greater sense of back-story wounds in the beginning and the plot can then build off them as its’ foundation? Or, is it ultimately more satisfying to see the present problem intensified by cookie crumbs left along the way, building to the climax? Hi Tyra, I’ll see if I can answer. I’m not too clear on what you are asking though. First, regarding the middle of your story. This is the muddle, where you complicate and make things as worse as possible, raise the stakes. So you would ask, how can I do this? What can I do that can make things as bad as they can for my protagonist? I believe you need to show the character’s core need, wound, fear, greatest desire all within the first page or two. For every character. The quicker you establish these, the quicker the reader will “get” them. That is not to say you dump a lot of backstory in, but rather through a character’s thoughts and speech as the present action is playing out, you reveal these bits to establish the mind-set, goal, need for each character. You can add more as the story goes along, and you should, but never too much at one time. Some people like it to sprinkling in seasoning when making stew. Usually all you need are a few lines here and there, adding mystery and curiosity, but not being so vague the reader is confused and frustrated. When unclear, return to the books you love and highlight with a yellow marker the scant lines of backstory through a scene to see how a great writer does this. That’s the best way to learn. Great questions! I’m editing my manuscript now, and I’ll keep these questions in mind. Especially how much time has passed. Not sure if I’m clear on that. Thanks! I always like to hear about the kinds of problems that editors see repeatedly in novels. This is a great list of questions to make sure address when writing. Thanks Susanne! Thanks, Becca. I’m happy to share this with you on your blog! These posts are great not only for writers, but also for editors. Thank you. I know, right? What’s wrong with the readers? It’s so obvious to me. That’s why I love getting feedback from the people who aren’t living in my head. What’s the best way to tell if a scene is important or needs to be cut? To me ALL the scenes paint a picture of who my characters are … but I know not all the scenes really work with the flow of the novel. So other than that “gut instinct,” is there a good principle for how to know which scenes to cut and which to keep? Stacy, that’s a great question. We want every scene to have a point to it. If you have a number of scenes that only reveal character but don’t advance the plot, it can drag a book down. The readers want to see the characters trying to reach their goals, so if they sit around and talk a lot and no new stakes, risks, twists, complications, or reversals occur, you may want to reconsider whether you need all those scenes. Or try to find a way to rewrite each scene so there are clear high moments that advance and complicate the plot. If you are making things worse for your character in every scene, that scene probably has merit! When you’re hit by a car, you’re in shock. When in shock, people don’t feel pain. Later, they might be in pain. Anna, this is a good point, that people respond to different scenarios in different ways. I can see how pain might be delayed for some. On the other hand, I was in a snow skiing accident years ago and broke my shoulder blade. I was absolutely in shock, but I also felt quite a bit of pain, too. This is one of those convenient scenarios where you can do what works best for your character and your story. It depends on what kind of schock. If you fall, it’s a different story. I had a broken shoulder blade too. But many victims don’t feel pain until later when experiencing an extreme shock. While some people yell, others don’t. 🙂 I have experienced both. This is such a great list of questions! Thank you so much for stopping in and sharing it, C.S.! Thanks for the kind comments! I got the idea to put this book together from my blog followers. Many told me they were printing out all the posts and putting them in a notebook, and I thought, hey, this is a lot neater than a big clunky notebook–and with an index, a lot easier to find the entries you need. Hope this book helps you all with writing better! This pretty well sums up my pre-write process for each project. I can fill a notebook with questions, and in finding the answers, I discover the story. Good list! These is a great little checklist of things to remember for each scene. Thanks! These are great questions to consider!! Thank you!! Thanks for the great post and excellent advice! I am so glad to know about the Live Write Thrive blog–what a wonderful resource for writers! These articles are red hot, burn your fingers “why don’t I use oven mitts”, helpful for novice authors. I have all three thesauri (plural Latin jokes are the best, don’t you agree? ), and several Grammar Girl books, but these weekly blogs are my North Star. Thanks Angela and Becca. Steve Jennette, Grand Rapids, Michigan. Great blog. Shared with my writing students–thanks! This is such a pivotal post – and shows how novels are born from questions and grow after the right questions are answered. That’s a great comment. Questions are everything. I wrote a fun post on Live Write Thrive called Why, Why, Why? because I was working on a critique for a client and just had to keep asking questions about the story (well, I do that all the time, really), but it got me thinking about how questions really can get to the heart of the story. We often think readers can read our minds, but they can’t!